This stuff keeps ice from forming on these freezing mornings. This was on Bryant Drive on Dec. 13. 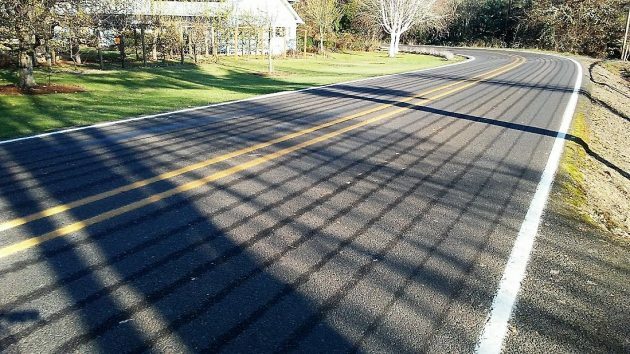 What are these stripes we see on our roads and parking lots on frosty mornings? Nothing fancy, just a salt solution that’s supposed to prevent the pavement from getting slick with ice. And it seems to work. Actually it “works really good,” Chuck Knoll of the Linn County Road Department told me when I asked him about this last week. The county uses a solution of magnesium chloride or similar salt. The stuff, concentrated salt water, has a lower freezing point than water and keeps ice crystals from forming when the thermometer dips below 32 degrees F.
At least it does when there’s no rain on cold mornings. When it does rain, the solution would wash off without effect, obviously. Hope you feel like yourself soon, Merry Christmas and thanks for the great articles. I noticed you were gone. I have had it twice, so I am glad you are better. Merry Christmas! Golly Hasso, think how much more painful your slothfulness would be if you were actually being paid for this work. Enjoy the freedom to be sick, but get better soon. I wondered where you were. Get well soon. You were missed! Praying for your complete healing Hasso! Best morning since the 16th. Hope you are feeling better and merry Christmas ! Even though some say there’s a war on it, Merry Christmas to you and we hope you’re feeling better. Am expecting some sort of Hering Exposé on illicit Santa sitings from your desk soon after the holidays. Hasso, everyone gets sick now and then, especially the young and the old(me). Take the time to get well and know that we will wait patiently for you, we’re not going anywhere. Merry Christmas and Happy New Year. Get well, Hasso. We’ve missed you. It was nice to read a new post this morning. Ray is right as rain. It is far better to lose traction, slide into a gaping ditch, flip your vehicle on its roof and have one’s neck snapped rather than suffer rust. Like Neil Young once opined; rust never sleeps. Hasso, get well and enjoy Christmas and New Year. Figured you were on a road trip or some other pleasant diversion. Gather your energy an get well soon. The blog is a nicety, not an imperative. Icy streets and sidewalks are treacherous, and something new to me since I moved here, at least in the mass quantities I observed last winter. I have been putting magnesium and sodium salts on the driveway and front walk but I worry about the plants and the run off to the river from the storm drains. I hope for you a speedy recovery, Hasso. Be well again soon, Hasso. You’re a far better reporter of local affairs than anybody on the Albany edition of the Corvallis Garbage & Trash (also known as the “Albany” Democrat-Herald). Thanks and Happy Christmas. Agreed! Ever since Hasso Hering left the helm of the Democrat-Herald, that publication has lost any legitimacy it might have had at one time. Zum wohl and Froeliche Weihnachten! From a long time reader and admirer of your observations. Keep ’em coming. Recovering myself. HASSO, SOMEONE NEEDS TO FIGURE OUT WHAT IS GOING ON WITH MTM. THERE SIGN IS GONE ON SANTIAM, hYUNDAI LOOKS CLOSED, BUICK SEEMS LONG GONE. IS MARK STILL RUNNING THINGS? Nice CAPS! Long strange one, eh… TRIPP? No, would be the answer on your Mark ? It would be fun to read a multi edition post on what exactly happened at MTM. Welcome back HH! Please keep me reading. Haven’t been in town as long as your family, so I son’t presume to know much. What I understand is that MTM sold to a fellow who now lives locally.. GM bought back the Buick franchise. At some point, there will be new signs on Santiam. Wishes for your good health and happy times. I’ve missed your posts and am glad you’re back. Take it easy, and enjoy the holidays! I’ve wondered about those lines. It’s comforting to see a modern solution to this winter problem. … I hope you’re feeling better soon. Merry Christmas. Glad you are on the mend. Did you get a flu shot? I did but it didn’t help with this virus.